What are the studies saying about coffee and weight loss? It’s just as easy to find a study talking about how caffeine can spike your blood sugar and cause fat storage as it is to find one that suggests that it may have fat burning benefits, suppresses appetite and acts as a diuretic! The truth is you need the antioxidants left in to get the additional blood sugar management benefits. For the only coffee I can recommend to increase your metabolism AND help you lose weight, scroll down. It is the only one I can find that has left the antioxidants in with a special processing. By doing this the coffee helps to reduce blood sugar. There is a lot of interesting information conveyed in the research and there are hundreds if not thousands of research papers and studies done on coffee and weight loss. It seems clear from the research that there are health benefits to moderate coffee drinking. Caffeine will boost your metabolism. One cup of coffee contains about 90 mg. and 200 mg. is considered to be a moderate, safe amount. 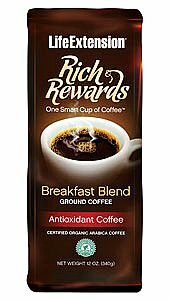 The lighter roasted coffee below formulated by Life Extension has significantly more health benefits than ordinary coffees because it's patented roasting process retains the all the potent antioxidants. The most significant one is called chlorogenic acid. There is double the chlorogenic acid in the Rich Rewards Coffee. What about this coffee and weight loss? The chlorogenic acid interferes with glucose synthesis and release in the body which helps to reduce sugar levels in the blood. There is evidence that combined with caffeine it boosts the preventive effect of chlorogenic acid against diabetes. If you love coffee, this is the one that will help you to support your weight loss. You're getting a real coffee, full bodied and real, full flavor and it's organic and has the most antioxidants! It comes with caffeine or without. You can click the buy button below and purchase here. Life Extension makes a rich, healthy roasted coffee 100% certified organic Arabica coffee with beans that are hand picked from the rain forests of Central America. It is roasted in small batches using their patented 100% natural roasting process that leaves in 254% more of the chlorogenic acids. These coffee blends retain the nutritional content of coffee beans with all the considerable antioxidant and weight management advantages. All roasting destroys some polyphenols (antioxidants) in coffee. The most important one is called chlorogenic acid. In this company's new patented roasting process the coffee beans are soaked and drained prior to being roasted. Later, after roasting, the beans go back into the same liquid in which they were orginally presoaked. This returns substantial polyphenol content to the beans. So what about coffee and weight loss – should you try coffee to help you get rid of your fat? I would not recommend it as a way to help you lose weight unless you go with the one high in antioxidants. It not only gives you far more health benefits with the antioxidants but it can also assist you with managing your blood sugar and increase your metabolism. The Life Extension coffee blends retain the nutritional content of coffee beans with all the considerable antioxidant and weight management advantages. For more really great tips to lose fat permanently keep reading below! When you reach 10,000 steps a day you are your way to losing weight and permanently changing your metabolism for the better. This habit will change your life! You want to know exactly what it takes to burn off that dessert you had after lunch? If you're a tea lover than by all means drink green tea to lose fat instead of coffee! Most people really don't understand the impact metabolism has on your freedom from obsessing about fat. 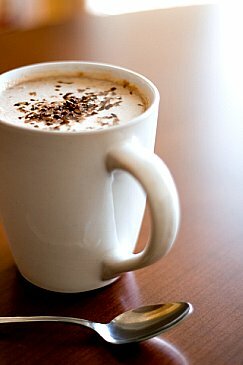 Return from Coffee and Weight Loss to Slow Metabolism. Return from Coffee and Weight Loss to Lifetime Fat Loss home page.